Since November 2014, Mr Šefčovič has served as the Commission’s Vice President in charge of the Energy Union, one of the ten main priorities of the European Commission. The Energy Union is the most ambitious energy project since the Coal and Steel Community was established in the 1950s. Based on five pillars – energy security, solidarity, trust; a fully-integrated European energy market; energy efficiency; decarbonisation; and research, innovation, competitiveness – it is a driving force for deep transformation of Europe’s energy systems and forward-looking modernisation of its economy. The far-reaching initiatives of Mr Šefčovič include: the Smart Financing for Smart Building initiative to renovate housing stock, the European Battery Alliance to create a competitive, sustainable battery ecosystem in Europe; the Platform for carbon-intensive regions in transition and related country teams; and URBIS to finance smart and clean solutions for cities. European affairs have been at the centre of Mr Šefčovič’s career for over a decade. In 2004, he was appointed as the Permanent Representative of Slovakia to the EU, contributing to the country’s major integration projects such as its entry to the Eurozone and the Schengen area. In 2009, he became the EU’s Commissioner responsible for Education, Training, Culture and Youth. Subsequently, between 2010 and 2014, he held the office of European Commission Vice President for Inter-Institutional Relations and Administration. In 2014, Mr Šefčovič was elected as the Member of the European Parliament, which led to him being appointed to his current position. 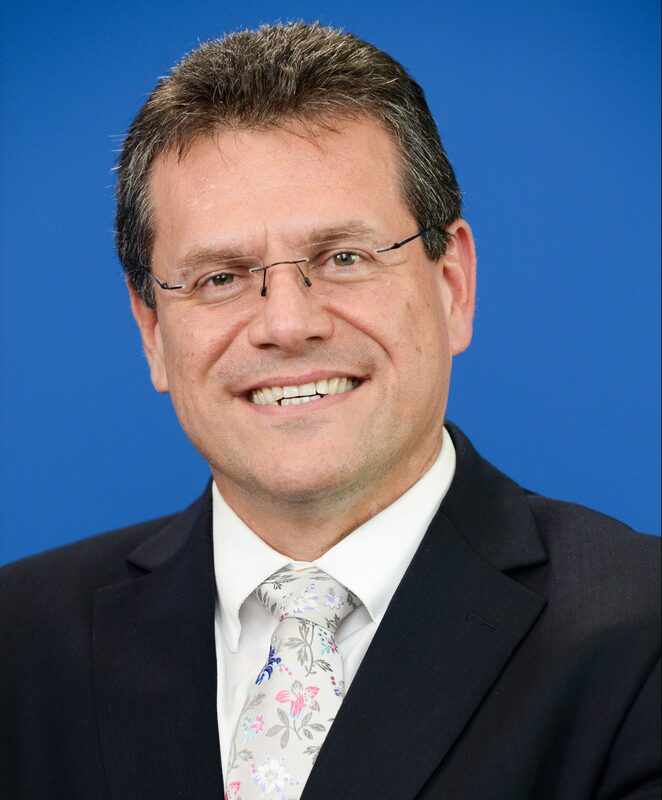 Prior to his career in Brussels, between 1992 and 2004, Mr Šefčovič held diplomatic posts at Slovakia’s Embassy to Zimbabwe as well as Canada, and served as the country’s Ambassador to Israel. He wrote a book “Driving the EU forward – talks with Maroš Šefčovič”, focused on his first mandate as the Commission Vice-President. In 2018, he was awarded the title of Doctor Honoris Causa at the Pan-European University in Bratislava, Slovakia.